Complimentary childcare is available on Saturday! 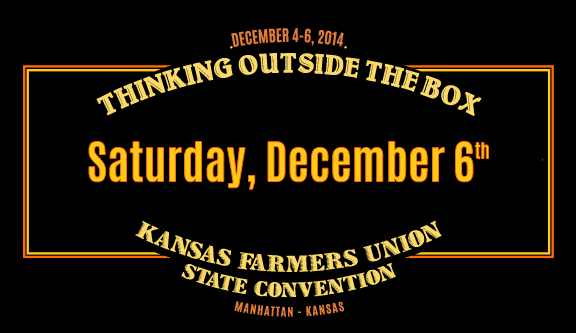 Join the Kansas Beginning Farmers Coalition for its 3rd annual Beginning Farmers Day. Featured presenter Cody Holmes of Rockin H Ranch in Missouri explores the evolution of his farm, from conventional crops and livestock to diversified, direct marketing powerhouse. USDA Rural Development, Kansas Forestry Service and Kansas Center for Sustainable Agriculture address opportunities for both beginning and experienced farmers and ranchers. And we tour the innovative Green Fin Gardens, a pioneering aquaponic farm specializing in pure blue tilapia, figs, and bananas in its fourth season in Pottawatomie County. Click on the ‘+Box’ to read the session description. KFU staff will be located in the pre-convene area for check-in and late registration. Local and regional food systems will receive a critical boost through the 2014 farm bill, with additional support for food hubs, farmers markets and on-farm businesses with a local or regional focus. In particular, the act supports increased economic activity through the creation and expansion of infrastructure, business services and supply chain coordination, and new connections between rural food producers and regional market opportunities. Such efforts boost the economic health of rural areas because, as USDA research shows, money spent on food produced locally stays local and expands the potential for job creation and economic growth — ultimately supporting strong local economies and expanded opportunity for rural Kansans. The Forest Service can assist producers with farm planning, how to utilize its many services and the conservation tree planting program. Many forestry related opportunities exist for beginning farmers including specialty crops, fruit, lumber and Christmas trees. Working with little to no start up capital the Rockin H Ranch grew out of inspiration and a dream of what could someday be. The only thing I inherited was a bad attitude and a drive to be a cattle rancher. The Early Years took about 30 years to get started and to eventually realize I had no idea what I was doing. But it didn’t matter once I realized the people that had directed me up until that point didn’t either. Growing with mostly leased ground, my herd of cows grew to about 1200 mama cows, a pretty good set of saddle horses and cow dogs. Little did I know this was just preparation for the real business of ranching. After about three decades of very long days and hard work I started running into a new breed of ranchers and business men that were talking a whole new line of ranching I had never heard of before. It sounded like it might solve some of my biggest problems I had created myself. This changed my whole life. Livestock diversification made since to me in Southern Missouri where forage production is extremely variable and diverse from fescue to wild black berries and lots of trees all growing in a pile of rocks called the Ozark Mountains. A mono culture species of livestock on a farm or ranch is an incomplete farm and one that is leaving lots of revenue on the table. Cowboys are supposed to hate sheep and sheep herders, but if sustainability and real ranch income is desirable adding sheep to a cow herd is probably the step every ranch should consider. Once the rancher realizes the increased productivity of one species added to the cow herd the next species is only the natural step. At the same time developing the ranch to a more Holistic approach to management through planned grazing, water and fencing, and less dependency upon chemicals and other inputs moves the entire operation beyond all the biggest obstacles to profitability in ranching. GreenFin Gardens is a pioneering aquaponic hatchery & farm in its fourth season in Pottawatomie County, Kansas, specializing in pure blue tilapia, figs, and bananas. For the past several years, GreenFin has been strictly a wholesaler, supplying some of the leading retailers in the industry with blue tilapia fry and fingerlings. This year they have expanded into retailing, offering end customers the chance to save money by cutting out all the middlemen and buying direct from a primary producer. Along the way, they’ve developed some interesting experimental gardening systems, including a semi-pit tunnel greenhouse, aquaponics tunnel, and tilapia garden pond. Aquaponics is the symbiotic combination of aquaculture (growing fish and other aquatic animals) and hydroponics (growing plants without soil). Basically: you feed the fish, the fish waste feeds the plants, and the plants clean the water for the fish. Diversified small farms have special needs when it comes to insurance and risk reduction. Jeff will share options available through the Midwest Regional Agency, a Farmers Union company. Regenerative agriculture involves a technique that improves soil quality, the nutrient content in the soils, water retention, and the reduction of purchased inputs for the ranch while increasing carrying capacity on a per acre basis. All experienced ranchers know that running more animals per acre in a productive manner has more potential for profit by reducing fixed costs per unit than increasing weaning weights, changing breeds, adding feed supplements or any other gadget sold by the so called agriculture experts. The ranching model that can decrease or eliminate outside purchases of inputs in the areas of fertilizers, chemicals, and seed but yet increase forage production has been available to us all along but missed by most ranchers in America. To become a Regenerative rancher or farmer is to move in a more productive form of food production. Kansas State University is home to the Kansas Center for Sustainable Agriculture and Alternative Crops – long name, helpful program. Learn about the Center and the sustainable ag programs it works with. More importantly this is an opportunity to learn about grants available from SARE – Sustainable Agriculture Research and Education (another long name, helpful program) especially the grant programs for farmers: Farmer Rancher Grant , Partnership Grant, and Youth Educator Grant. We’ll discuss what types of programs have been funded, what SARE looks for in a grant, and how to get started writing a grant. Although turning our traditional commodity of cattle into a food product may seems beyond the scope of ranching it is indeed a very important aspect of the revenue generating stream. Some call it Value Added, but in reality its just the natural way all people eventually get food on their table. Learning how to market, direct sale, package, and distribute to an ever growing demanding consumer places the progressive rancher in a very good position. These learned skills do add more value to the ranch and its revenue through the production of food rather than a commodity that will have great increases in unit value. And the good thing about this model is that a larger and larger populace are demanding the very thing that us ranchers can do and the big food companies will never be able to. This puts us in a very good position to be in today. Thank you for sharing your day and time with us. Safe travels home!